Go to Home page for the Mass Readings for this Sunday. Gospel is John 2:1-11. First Reading is Isaiah 62:1-5. Second Reading is First Corinthians 12:4-11. Galilee,- the first ‘sign’ that Jesus worked, even before he began his ministry of preaching. This event points to much more than a re-telling of what happened. There’s a Hebrew word that helps us understand the events and saying of Jesus, particularly in St. John’s Gospel. The word is DABAR… a Hebrew word telling us that some event is a WORD, meaning that it tells us something beyond the event itself. The greatest Word-Event of all happened when “the Word became Flesh”, in the person of Jesus of Nazareth. And all the Signs that John tells us about- and there aren’t many of them recounted in John’s Gospel- are ‘I AM’ signs about the person of Jesus of Nazareth, where the Word becomes flesh. Now, re-read the CANA story, in the beginning of John Chapter 2. It’s a very traditional village wedding, where all the neighbours are invited, and any visitors as well, such as ‘the friends of Jesus’. (We could think here of the musical ‘Momma Mia’ and all the fun of the wedding!) So many came that it seemed there would not be enough left to drink,- a huge embarrassment for the hosts. The Mother of Jesus whispers to him ‘They have no wine!’ Jesus seems not to answer her. She simply says to the head Waiter, ‘Do whatever he tells you.’ She knows her Son! And the ‘Sign’ that he works, the changing of so much water into such wonderful wine,- this sign tells us about himself, namely that no matter how many people come to him, they will never be thirsty or hungry, and there will never be shortage of any kind. Everyone who comes will have more than enough. And this plays out again and again throughout John’s Gospel. And that’s how this event becomes an ‘I AM’ sign,- it is pointing to who Jesus is, and his limitless love and generosity for the whole world of people. ‘If any are thirsty, let them come to me and drink’, he cried out later in the Temple (John, Chapter 7). ’Draw some out now!’ is what he says to us in today’s Cana event. Jesus is the lavishness of God, made flesh! He is the ‘flaithiúlacht’, the princely-ness of God, down to earth. This wedding at Cana is symbol of the wedding of God and God’s people,- “your land shall be called ‘The Wedded’” – in Isaiah 62, the First Reading for this Second Sunday of the Year. If you can, spend a little time with it,- it’s so full of the promise of God to be with his people, wedded to them, rejoicing in them, delighting in them,- God like the bridegroom rejoicing in his bride! God is with us, and we are like husband and wife with each other, delighting in each other. There’s food and drink (and plenty of it), in this Banquet of today’s readings. ‘Rogha gach bí, ‘is togha gach dí!’- ‘a choice of every food, the best of every drink’,- from the old Irish epic story, the Táin. 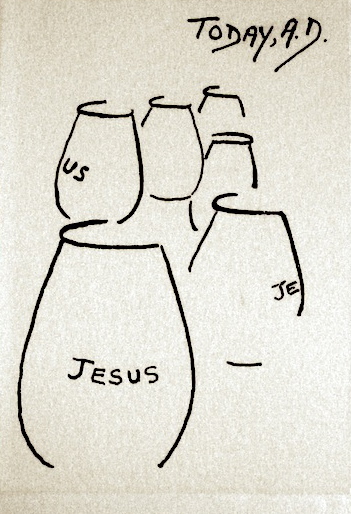 The same, at the banquet that is Christ. Draw some out now. P.S. The Scripture Passage for the Octave of Christian Unity in 2013 is from Micah Chapter 6: ‘This is what the Lord your God asks of you,- to act justly, love tenderly, and walk humbly with your God.‘ We are called on to engage thoroughly with this challenge together in our Christian Churches. The Octave goes from January 18th to january 25th. ← Dear Sinead and Mark,- January 13th, 2013, Feast of the Baptism of the Lord.